Farmfair International is pleased to partner with the Olds Fall Classic and Lloydminster Stockade Round-up to create the Alberta Supreme Show, which will showcase breed champions from all three of the top cattle shows in Alberta to name two Alberta Supreme Grand Champions. The Grand Champions from all breeds and their owners will compete head to head for the Alberta Supreme Show titles and the chance to drive away in a brand new RAM truck. Thank you to Alta Genetics and Davis Rairdan International for sponsoring the top five qualifiers! Each will receive a $250 gift certificate from the respective company. Returning for 2018: Lloydminster Agriculture Exhibition Association, Northlands and Olds Regional Exhibition are excited to continue another elevation to their existing partnership model. 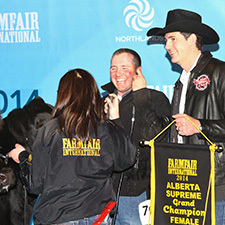 Alberta Supreme Stakes is an opportunity to recognize outstanding achievement of exhibitors and their respective Female and Bull Champions and Reserves at each partnership show including Olds Fall Classic, Stockade Round-Up and Farmfair International. Points will be awarded to each bull and female breed champion and reserve at each participating show. 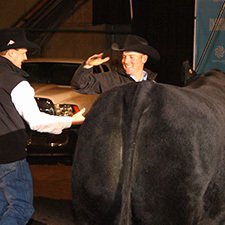 The show Female and Bull that receive the most cumulative points after all three shows will be declared the Alberta Supreme Stakes Champion Female and Alberta Supreme Stakes Champion Bull. Exhibitors will be presented CASH for each of these prestigious titles! Congratulations to our 2017 Alberta Supreme Grand Champions!